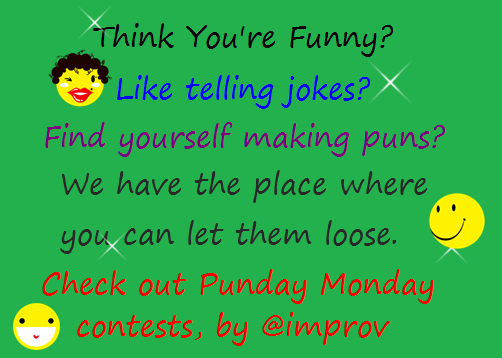 If you enjoy jokes, this is your chance to award your favorite jokes from this week’s Punday Monday with your praise and your votes! There are so many ways to vote on the Steem blockchain. The most popular, obviously, is the Upvote function. When you read a pun you like on that post, give it your love! Not only will the punsters feel good about having brought you enjoyment, they will also get some STEEM! Another popular way to vote is with your voice! In a comment or post, tag the user who made the pun you like and let them know that you like it! But neither of those is the way we determine the winner of this audience favorite award. In order to vote for your favorite punster of the previous week, you’ll send them POCKET in a comment on this post. The next section will tell you how. How do you send POCKET? pocketsend:[email protected],this part is where you tell the punster what you liked about their pun. This is all you do with the POCKET. If there are other uses for it on the blockchain, I don’t know. Why did I make audience voting like this? I wanted a system that used a finite resource that wasn’t very related to the personal finances of any individual. By using POCKET, we can see people bidding up their favorite punsters or working together to root for one pun or another. Even if one punster ultimately comes in second, they still get something for their trouble, an instrument that they can use to vote for their favorite punsters in future rounds! We ended our first season of the POCKET Choice awards on October 1st. The Winners’ Circle from Season 1 will be indelibly branded onto our brains. Will your favorite punster be a new member of The POCKET Choice Awards Winners’ Circle Season 2? The winner wins a #steembasicincome unit! This was initially made possible thanks to prize support for the #PundayMonday community from @curie, and now it is the standard! Punday Monday accepts new puns right up until the next Punday Monday! So, if this is the first you’re hearing of it, head on over, and try your hand at punning! Thanks to @pixiehunter for making that image! @steemfiction has published my work, and that of seven others in a supernatural short story anthology. If/when you use my referral links, we both benefit!